Detail your Ford Super Duty with this tough looking RealCAMO "Forest Fall" Camouflage 4x4 Off Road decal that can replace the existing easily-removable factory decal. Packaged in a set of two (2) and is uniquely designed in RealCAMO "Forest Fall" camouflage with a fine Green outline. A Black to White faded outline as shown in the picture finishes off the custom design. Get ready for hunting and make your Super Duty REALLY stand Out! 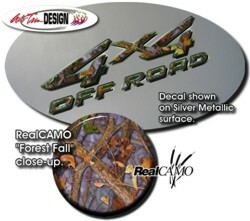 Auto Trim DESIGN's RealCAMO line of camouflage consists of real photographic images. The printed output is high definition and looks very realistic as can be seen from the picture above.